Contrary to popular belief, trends don’t come and go. They evolve. We see it every daya t Robb & Stucky. Understanding how trends ebb and flow can help you pass on passing-fancy trends (think fidget spinners) and give a thumbs up to trends with staying power (think Audrey Hepburn and that iconic strand of pearls). In the world of interior design, “the layered look” is trending. It feels new, hot and fresh – and it is. But the approach of layering like items with tasteful aplomb has been percolating for many seasons, even years. Here’s how it’s gorgeously evolving in the realm of accent tables. Was the idea of nesting a series of incrementally larger identical tables inspired by matryoshka dolls? We can’t say, but nesting tables have been Robb & Stucky designer favorites for years, with no end in sight. Today’s most popular styles are twinsets: two perfectly scaled and fitted tables that wow. 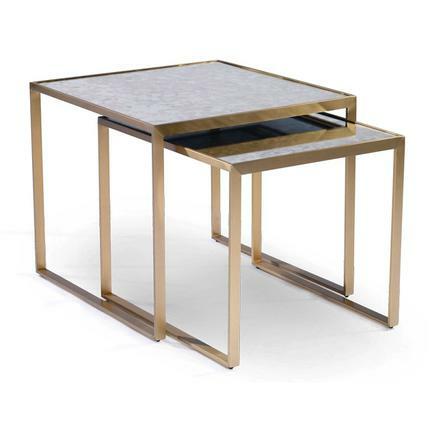 Mitchell Gold + Bob Williams Astor twins are the pinnacle of the nesting table trend. The shapes are sleek and modern with a vintage vibe. Note the glowing brushed metal frames and antique mirror table tops. A brilliant juxtaposition. Mitchell Gold + Bob Williams Astor tables exemplify the nesting table trend. At Robb & Stucky. More recently, the nesting table concept has spread its wings at Robb & Stucky. The latest development is in the realm of cocktail tables, where bunching is the latest and greatest, hot new thing. Deservedly so! Bunching cocktail tables are brilliant. Here, two accent tables flank the primary coffee table. The smaller sidekick tables can fly solo, and work the room during a party. They can neatly rejoin the mothership (A.K.A. cocktail table), and tuck tidily away when not in use. 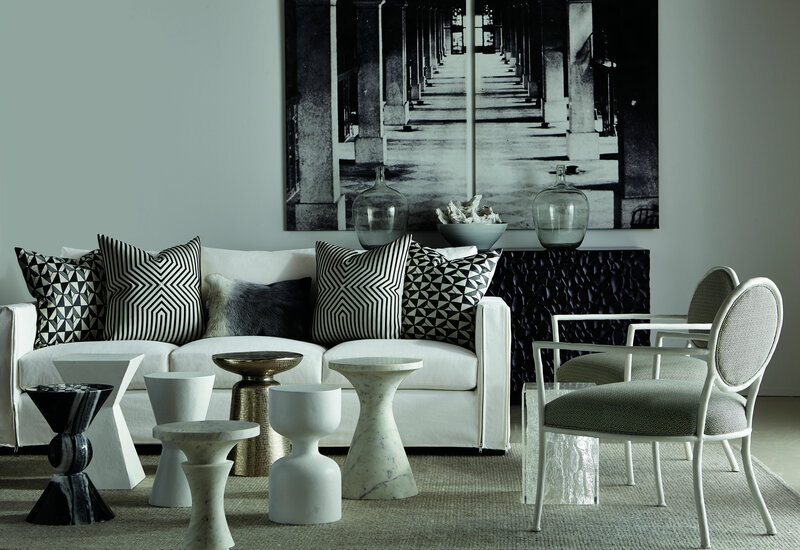 Three’s perfect company with the Bernhardt Cowan Bunching Cocktail Table. At Robb & Stucky. Birds of a feather flock together, so why not accent tables? Today, Robb & Stucky creative interior designers are assembling series of seemingly random individual tables in cocktail table-like groupings. These tiny tables are like little gems gathering to create a beautiful whole. The flocking trend eschews rules. As a result, someone who knows the rules ought to break them! Trust one of our talented interior designer to thoughtfully develop this seemingly spontaneous look on your behalf. Then, accept all oohs, aahs and kudos from friends and family! “Flock” a series of unique tables together to create a beautiful whole. At Robb & Stucky. The layered look in interior design is not a hiccup. It’s a genuine trend with many incarnations, from nesting to bunching to flocking. Find your decorating comfort level and start layering. Robb & Stucky is here to help!